Patrisia Macías-Rojas is an Assistant Professor in Sociology and Latin American and Latin Studies at the University of Illinois at Chicago. Her research interests are in the areas of race, law, and migration. Her current work focuses on the politics surrounding the criminalization, deportation, detention, and incarceration of immigrants on the U.S. –Mexico border. Macias-Rojas studies the effects of “tough on crime” approaches to immigration control on the everyday practices of Border Patrol agents, local law enforcement, civil and human rights advocates, and migrants and residents of predominantly Latina/o border communities. More broadly, her research examines historical, economic, and political links between the immigration and criminal justice systems. Her recent book, From Deportation to Prison: The Politics of Immigration Enforcement in Post-Civil Rights America (New York University Press, 2016) analyzes how the politics and policies of civil rights reforms and mass incarceration gave rise to the punitive turn in immigration and border enforcement. From Deportation to Prison won the 2017 Oliver Cromwell Cox book award from the American Sociological Association’s Section on Racial and Ethnic Minorities. Prior to joining Sociology and Latin American and Latino Studies at UIC, she taught in the Sociology Department at Sarah Lawrence College in New York. 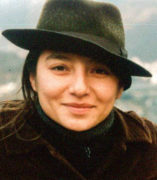 Professor Macías-Rojas received her MA and Ph.D. in sociology from the University of California, Berkeley. Patrisia Macías-Rojas was on the Tavis Smiley show in September 2016 discuss her new book, From Deportation to Prison: The Politics of Immigration Enforcement in Post-Civil Rights America.